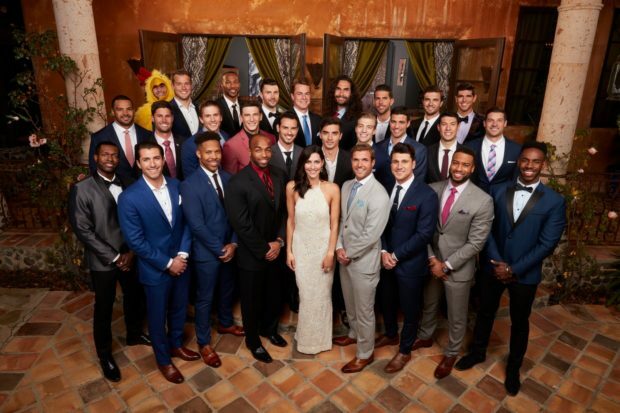 In the words of Becca, “Let’s do the damn thing!” Welcome to Season 14 of The Bachelorette, wherein we watch Minnesota native Becca Kurfin look for love while wading through a sea of professional athletes and pharmaceutical sales reps. Are you as excited as I am? Becca’s time as the titular Bachelorette began in an unorthodox manner. She won Ari Luyendyk (Read: Luyendick) Junior’s season of The Bachelor, but got dumped on television anyway when he realized he liked Lauren B. better. Suddenly, Becca was transformed into America’s sweetheart and became the avatar for scorned women everywhere. As such, she received the honour of having a group of twenty-eight reasonably good-looking men with questionable employment status compete for her affections. Let’s hope Becca fares better than the first time she looked for love on the franchise. Judging from the premiere, it looks as if producers are representing Becca as an everywoman. Early in the episode, she tells viewers, “I’m just your normal average girl. All I did was get my heart broken on TV.” It’s a little on the nose, but the statement successfully feeds into the show’s fairytale narrative that true love is just another Rose Ceremony away. Well, it is if things on the show work out for her. Becca’s a little worried this new batch of men will reject her the way Ari did. As the episode starts, Becca is by herself through the woods of her native Minnesota. She looks pensive in her parka, as we see her trudging through the snow. The opening constructs this woman is Alone, with a capital A. Because, I guess, the series believes that single people don’t have friends or family to go on hikes in the woods with them? Apparently, they must go on winter hikes unaccompanied (unless you count the camera crew that accompanied her). Later, Becca whizzes down the highway by herself in a red convertible. Again, she has no friends to bring along for the ride. The only friends Becca is permitted to have are former Bachelorettes. I have gleaned this from the fact that JoJo, Kaitlyn Bristowe, and Rachel Lindsay show up at the famed Bachelor Mansion to dispense advice. I am not sure how their advice would be helpful. Why would one want advice from a group of women that one has never met, and who all picked some of the shadiest dudes on their respective seasons? I’m sure Becca has friends IRL, and I wish producers would allow her to spend time with them instead. Anyway, JoJo, Rachel, and Kaitlyn inform 28 year-old Becca that they are all part of a “sisterhood” that links past, present – and presumably future – Bachelorettes to one another. You know, sort of like The Illuminati is rumoured to link Angelina Jolie and Kim Kardashian. Next, they burn sage to cleanse the house of “bad juju.” Yes, it’s Night One, and the show already has appropriated indigenous culture. Soon the other members of The Bachelorette Sisterhood depart. It’s finally time for Becca to meet her man meat. The dudes are prepared to assemble for opening night, where they drive up in limousines to meet The Bachelorette in the hopes of finding love (Read: Instagram fame). Because the majority of the contestants are beefy bros, I am currently having a hard time telling many of them apart. But one who stood out for me – and for Becca was Garrett, a medical sales rep from Reno. Like Becca, Garret also enjoys walking alone in the snow. Maybe, if things walk out, they can walk through the snow together! And the odds of this happening aren’t bad, because Garrett took home The First Impression Rose. For the uninitiated, The First Impression Rose is the prize our bachelorette bestows on the man she likes the best on Day One. In the past few seasons, all the winners of this floral prize have gone on to win the show. In short, it’s a big freaking deal! It’s a predictor of future success, the same way the winner of the SAG award usually wins the Oscar for best actress, too. Then there’s Lincoln from LA. Lincoln is so hot I didn’t notice much else about him, but apparently, his mom really wants him to get married. I can’t imagine it would be hard for him to settle down, though, because I can’t fathom anyone on Tinder not swiping right when his face pops up. 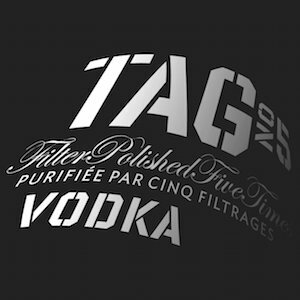 There’s also Jean Blanc, who’s from Haiti and whose job is listed as “colognoisseur,” because apparently, he likes cologne. Yes, dear readers, I know that “colognoisseur” is not a real job, but another guy listed himself as a “social media participant,” which isn’t a real job either. I don’t think career viability is a major concern for the producers when they cast this show. After all, they’ll all be famous on Instagram when everything is said in done. They’ll make money hawking protein supplements and flat tummy tea. In addition to the aforementioned fellows, Becca had not one – but two – suitors with man buns show up to vie for her heart. I appreciated this because many of the other men sported the same GI Joe-inspired hairstyle, which made it that much harder to tell them apart. As a reality TV recapping professional, I appreciate when people look distinctive. Of course, the introductions were ludicrous. Someone showed up with a bull – not a mechanical one, but an animal one. 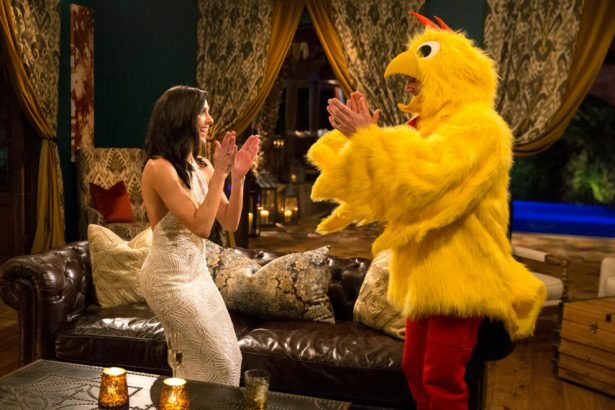 Another guy wore a chicken suit, so he’s obviously this season’s Whaboom Dude. Oh, and for those of you who don’t remember, Whaboom Dude just said “WhaBoom” a lot. It was sort of his catch phrase, and he really enjoyed yelling it out in public. He was really thirsty for “WhaBoom” to start trending on Twitter. Now, my personal favourite was Joe, a grocery store owner from Chicago. If I were in Becca’s place, I would pick him because I like food, and his job gives him access to large quantities of it. However, I predict the fan favourite will be Colten Underwood, the NFL star who runs a charity that helps kids with cystic fibrosis. He has a really cute dog and is a doting uncle to his niece. Plus, he’s ripped. I predict he will be named the next Bachelor. Find me on Twitter, because I’ll bet you $5 that I’m right! In the end, the men who went home after the inaugural Rose Ceremony were Chase, Kamil, Christian, Darius, Grant, and my beloved Joe The Grocer. Oh well, Joe! It’s okay, you’re a winner in my heart! Anyway, see y’all next week! The Distillery Christmas Market Will Open On November 15th!